I’m so very sad to say that Helen passed away on Sunday 11th June 2017. Before she passed away we discussed her blog. Helen loved the idea of me contributing to it after she’d gone. So, here I am. I won’t be able to match her exciting stories or journalistic skills but I hope I can let some of the spirit of her List for Living continue. Here’s one of my favourite photos of the two of us. It’s a selfie we took after Helen’s 44th Birthday party. The party had been a great success. Helen had chosen a gold theme and the house was decorated with helium balloons in the living room and gold pineapples in the fruit bowl. Helen introduced me to many of her friends and family, and everyone had a great time. After the last guest had gone home, we sat on the sofa, both tired out. Helen wanted to take a selfie. I grumbled – I’d already changed out of my party clothes and I’m not the most photo happy person at the best of times– but I agreed. What I like best about this photo is that Helen wanted to capture the whole feeling of that moment: after the party, the two of us, just being with each other. We were both so happy and completely in love. Helen was caring, loving and kind, and I will always treasure our time together. She inspired me with her laugh, her jokes, hugs and smiles. Goodbye Helen, I love you. Luke and I got engaged almost a year ago and I’m delighted to say that we had a winter wedding. The morning started with the most beautiful frosty sunrise. The day itself was so special. It was even better than I could ever have imagined. This was the most magical, wonderful day of my life. We’ve been married a couple of months now. Luke is an incredible man. He’s the best husband you could wish for. It makes me very very happy to be married to the man I love. Yes it’s been a while. Over the past few months I’ve become very ill. The main treatment finished in the summer but I contintinued with a maintenance chemo until December which was exhausting. It means I’ve now had more than a hundred sessions of chemo! I also started vomiting a lot, everyday. Loads more than normal. I stopped being able to eat properly and started to get really poorly. Things came to a head and I ended up in hospital just after Christmas. It’s my last chemo. In total this is number 78. What a terrifying achievement. It’s both ridiculous and amazing that I’ve had so many of the toxic cocktails. They’ve made me horrifically ill and but also they kept me alive. It’s been around 14 years since I was first diagnosed but it’s been in the last four years that I’ve had most of the chemo. As you know I travel a long distance by train from my home in the Cotswolds to London for treatment. I quite enjoy the journey. It’s also easier to be ill on a train than in someone else’s car! Looking out at the countryside also helps to put things into perspective. The landscape looks so very beautiful. When you’re aware that your life maybe limited, things take on a new meaning. On these train journeys, when I look out the window, the colour of the land and the sky seem to be more vivid. Somehow much brighter. Like it’s being filtered though some kid of photo app. Or maybe I’m just noticing more especially after being cooped up at home most days. Whatever it is I’m glad that soon I won’t be having make this trip to get a big dose of toxic drugs. This is just so hard. The tiredness is relentless. There’s only a couple of weeks to go but there are times when I feel like giving up. But I’m not and I won’t. I know there isn’t really an option so I just have to somehow get through chemo no 77 and 78 and the debilitating side effects. As I’m constantly shattered my goal most days is just to have a shower. Having a shower AND washing my hair – now that is a big achievement. I was warned about being totally exhausted but I didn’t think it would be this bad. Perhaps I did but I didn’t want to believe it. If I fully appreciated how awful it would be, then I might not be doing this all again. A while ago I had an enforced week off from chemo and it was brilliant. It really helped my immune system to recover from all the evil chemo cocktails. Mentally it was great to have a break from the seemingly never-ending treatment. It also enabled me to remember what it’s like to feel well and realise that this chemo will come to an end. Another reason that it can’t be over quick enough is that my hair is starting to fall out. I was told that my hair would thin but I wouldn’t go bald. I suppose thats what’s happening now. There are noticeably more hairs on my pillow but I’m not too worried. After having my hair fall out three times, I know that what’s going on should not alarm me. It’s not coming out in handfuls. But even so, I don’t like it. I just try to ignore it, safe in the knowledge that I still have lots of hair. One thing that’s me helped each week has been a random act of kindness. Back in April I wrote about how fizzy sweets really helped. My anti-cancer drugs are very toxic because they are made from heavy metal and this gives you a horrible taste in your mouth. A couple of days after that blog post, my friend Keith sent me a load of different fizzy sweets in an old fashioned sweet shop jar. I got the surprise parcel one night after a long day on a drip. I’ve been taking a bag of them with me on each trip to hospital. Cola bottles and fizzy fruit balls are the best. They really do the trick. But they are extra special to me as it was such a lovely gesture. Now the sweets have almost gone and I have just two more chemos to go. The sight of the almost empty jar makes me very happy that the treatment will soon be over. I love a good train journey. It’s not that I’m a train spotter! I just like traveling on railways. It’s a good job as it’s part of my chemo commute – it’s how I get to hospital each week. I’ve always thought steam trains looked so romantic and I’ve wanted to go on one for ages. And so I did just that! A while ago the Gloucestershire Warwickshire Railway held a ‘Wartime in the Cotswolds’ weekend. Visitors were asked to dress up as if they were from the 1940s. Luke and I joined in too. There were people in allied uniforms, as well as civvies and the odd spiv with a suitcase. Each station along the route was decorated and there was live music too. It really did feel like you were back in the era of the steam train. 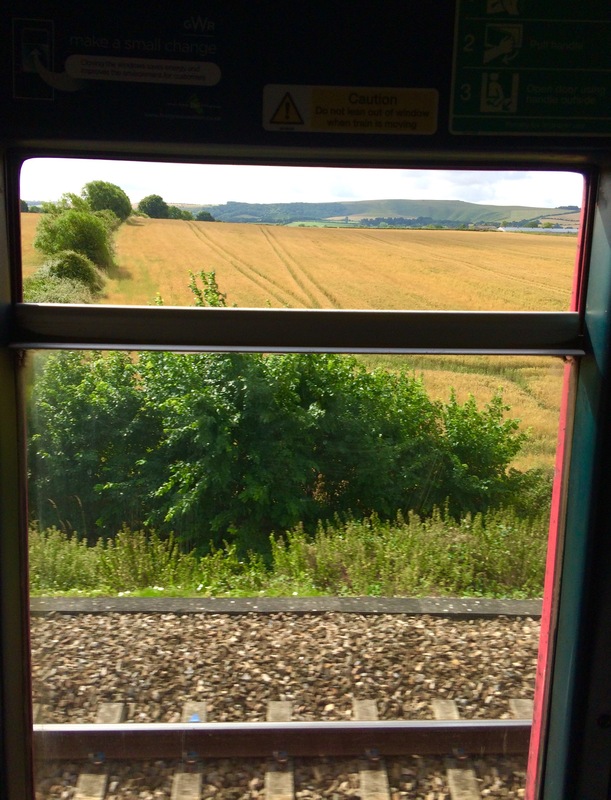 It was so special to be chugging through the Cotswold countryside. The steam clouds from the locomotive created shadows which followed us in the fields next to the track. The trains were packed but Luke and I managed to get seats in a first class carriage. We shared the luxury with a nurse and solider in authentic vintage costumes. The seats were very comfy and there was even a dimmer switch for the light! We did this a couple of months ago but tiredness has meant I hadn’t got round to blogging about it. A lovely week off treatment plus a steroid high when the chemo mini-break was over has helped to get this written. This was a perfect item to tick off from my List for Living while going through chemo. It required very little effort but it managed to transport us back to a different age. So much of my time is spent on the sofa while this meant that instead of watching something, I was actually able to experience it. I’d been seriously thinking about taking a week off as the chemo had got so exhausting but that decision was taken out of my hands. Last week as usual I had blood tests when I arrived at hospital. These are to make sure my body is well enough to cope with the evil cocktail of drugs. I knew that I’d been feeling awful for several days. It turned out that I really was properly ill. The results showed that basically my immune system was too poorly for chemo. For anyone interested my neutrophils were 1.4. It means that I am have neutropenia and much more susceptible to infections. At hospital I was told that I should spend my time off resting. After a magnesium drip I was sent home. It felt weird, almost like I was skiving. I hate the chemo but I was mentally ready for it. Instead we got to go home early. I was warned that having the week off could make me feel much better so I shouldn’t over do it. But there’s been not much chance of that. For the fist few days I just felt knackered and mostly snoozed on the sofa. The biggest change is that I’m not attached to a bottle of chemo which needs to be carried everywhere. It means that this has had a week off too. I’m so aware of having all this stuff attached to me that it’s strange to not have to worry all the time. Usually I have to make sure I don’t move my right arm too much otherwise the needle could pop out. I have to be careful that the tube doesn’t catch on anything, especially door handles. Every time I stand up I need to remember to have that stupid bag wrapped around me. After almost a week off I am starting to get a tiny bit better. Getting your brain and body back is an incredible feeling. Suddenly your head clears and you can move around a lot easier. It’s not all good though. When you’re really ugggggh you tend to focus on how horrible you feel. However when you’re not so ill, you become much more aware of normal life and what you’re missing out on. It becomes tantalisingly close but it’s still just out of your grasp. But even so I’d much rather feel like this than really sick. I know that my chemo mini-break must come to an end soon. Despite how dreadful the drugs make me feel and how inconvenient how the bottle is, I really hope that I’m well enough for the toxic treatment this week. I don’t want anymore time off. Well I do, but i know thats not the best option for me. This stuff is helping to enable me to live longer and however awful it is, I need to finish this course of chemo.